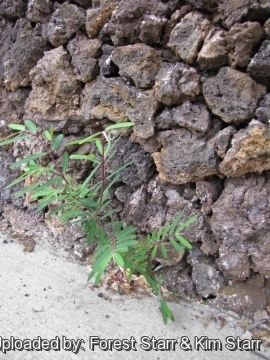 Habit at Puu o Kali, Maui, Hawaii (USA). May 26, 2004. Habitat and ecology: Chamaesyce celastroides var. 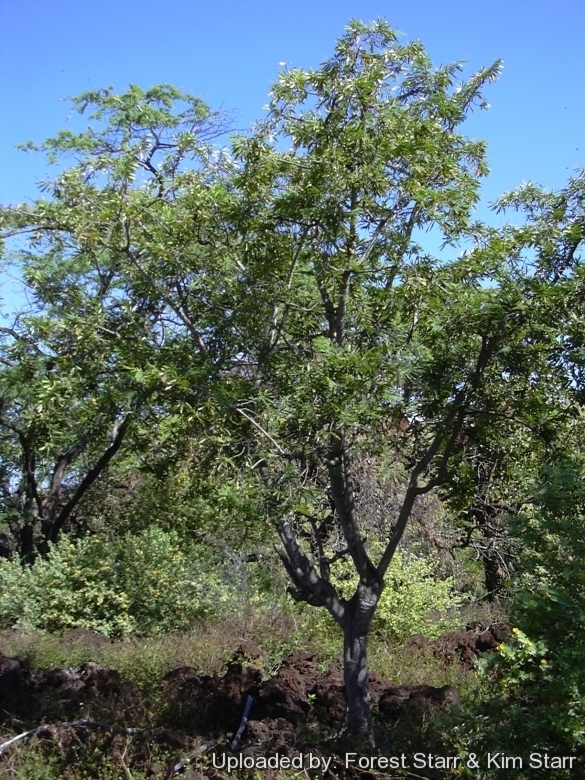 lorifolia is a more tree-like variety found in moister coastal areas, graasy hill tops, and mesic forests on Lānaʻi where it is now rare and on Maui where it is placed in the vulnerable status, but it was one of the dominant components of high elevation dry forest. 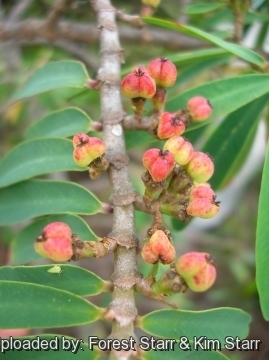 Though a tree-like species, it is apparently not as tall in height or as wide in diameter as another native tree ʻakoko (Chamaesyce olowaluana). Chamaesyce celastroides var. lorifolia is important for native animal and plant species. Hawaiʻi's only native bees (Hylaeus spp.) use this species as a important food and nesting source. An extinct honeycreeper, the Lānaʻi hookbill (Dysmorodrepanis munroi), searched for small snails among foliage of ōpuhe (Urera glabra) and perhaps Chamaesyce celastroides var. lorifolia. Today, though the vast Chamaesyce celastroides var. 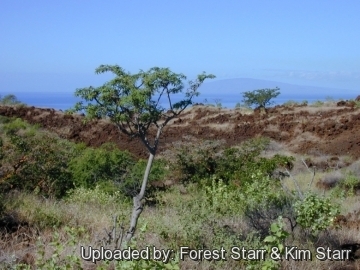 lorifolia forests are gone, a few trees still remain on Lānaʻi and Maui, but now a faint reminder of times past. Disturbance caused by grazing, conversion to pastureland and the invasion of alien grasses, increasing the likelihood of serious fires, have all contributed to the decline in the habitat. These rare spurges are in danger of disappearing. 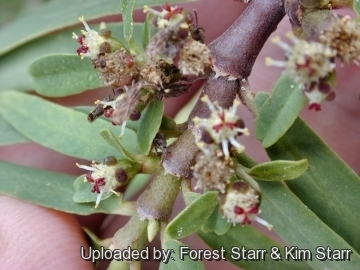 Description: The Akoko Euphorbia celastroides var. lorifolia , previously also known as Chamaesyce celastroides var. lorifolia is one of the several varieties of the widespread and variableEuphorbia celastroides. It is a small shrub less than 60 cm tall or a small tree up to 5 metres that is easily distinguished by its long thin leaves. The flowers are not attractive. The red or pinkish fruits, however, enhance the beautiful foliage. 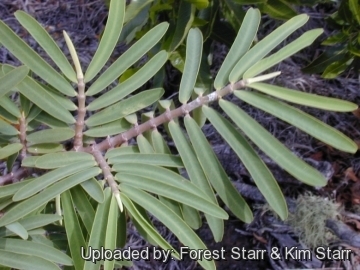 The varietal name, lorifolia, strap-leaf, in reference to the long leaves of this ʻakoko. 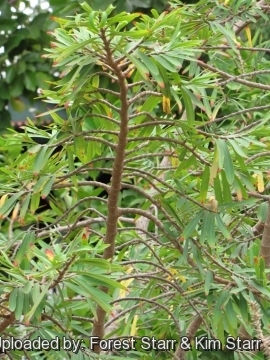 Stems: It forms a loosely branching trunk. The secondary or young branches are stiff, with short internodes. Leaves: Distichous (growing in two vertical rows), 5 to over 7.5 cm long light or medium green that may have a slight glaucous coating. Often the leaves in the summer assume a red-violet colouring. It does not lose its leaves in the winter, due to the warm climate of its range, but is drought-deciduous. Damaged or old leaves turn a blood red as they die. Phenology: Euphorbia celastroides var. amplectens, produces flower and fruit sporadically throughout the year. 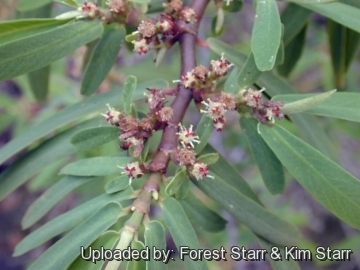 1) Forest & Kim Starr “Euphorbia celastroides (akoko)”. Plants of Hawaii. <http://www.starrenvironmental.com>. Web. 27 Sep. 2014. 8) George C. Munro "The Story of Lānaʻi", pages 64, 67-68, 212-213. 9) Beatrice Krauss "Plants in Hawaiian Culture" by, page 138. 10) J.F. Rock "The Indigenous Trees of the Hawaiian Islands" by , pages 50, 261. 11) William McGeorge & W. A. Anderson "Euphorbia lorifolia, a Possible Source of Rubber and Chicle" by , page 98. 12) H. Douglas Pratt "The Hawaiian Honeycreepers: Drepanidinae" by , pages 130, 217-218. 13) Robert Pearcy & John Troughton "Photosynthesis in Tree Form Euphorbia Species from Hawaiian Rainforest Sites" by , page 1055. 14) A.C. Medeiros, C.F. Davenport & C.G. Chimera "Auwahi: Ethnobotany of a Hawaiian Dryland Forest", page 21. 15) Native Plants Hawaii. “Euphorbia celastroides var. lorifolia” <http://www.nativeplants.hawaii.edu> Web. 27 Sep. 2014. 16) World Conservation Monitoring Centre 1998. Euphorbia celastroides var. lorifolia. The IUCN Red List of Threatened Species. Version 2014.2. <www.iucnredlist.org>. Downloaded on 28 September 2014. 18) SHERFF, E. E. 1938. 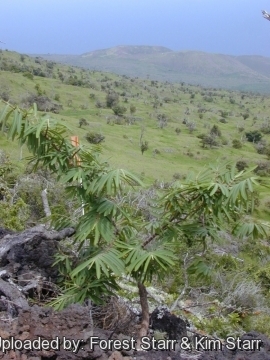 "Revision of the Hawaiian species of Euphorbia L." Ann. Mo. Bot. Gard. 25: 1-94. Cultivation and Propagation: Euphorbia celastroides var. lorifolia or akoko is an attractive tropical species that requires temperatures of 15 °C and light shade. This plant develops in a fashion similar to a shrub or small tree and is tolerant of heat and drought. Maintenance: This species do tend to get sort of leggy, which is particularly a problem if grown as a potted plant, and pruning is sometime necessary to shape. Repeatedly pruning also help to encourage new growth. Hardiness: This spurge is tender, hates prolonged cool and is suited for tropical or subtropical climates, it is killed at 0°C or colder for any appreciable length of time, but may survive cold weather even if it end up getting nearly defoliated each winter. (USDA Zones 10a-12b) Any temps below 4° C degrees call for protection for this plant. Seedling growth arrests below 15°C. Wind hardiness: It is very tolerant and even survives to strong hurricane wind with minimal damages, but will grow better with slow wind. Salt tolerance: It is tolerant of coastal and beach exposure, as well as salt spray. Hawaiian Uses: The wood of this ʻakoko was used as firewood, the leaves medicinally, and the latex used as an ingredient in canoe paint. Pest and diseases: They are susceptible to fungal diseases. Wet soil quickly causes root and stem rot, especially during winter months. Pests of akoko include whitefly, and scale insects. The plants also attracts root mealy bug which should be treated with a systemic pesticide or horticultural oil. Often the scale in-sects and mealybugs are brought in and protected by ants. Propagation: Seeds or cuttings. It is best to collect seed just before or just after the capsules split open to be sure to have fresh but mature seeds. Because of the small size of the seedlings, place little or no cover over the seedbed. Take extra care to avoid letting the seedbed dry out. The seeds will begin sprouting in one to two weeks (sometimes take longer). Let the seedlings grow to about 5 cm in height before separating and transplanting to individual containers. You can also propagateEuphorbia celastroides by stem tip cuttings. Take cuttings about 10 cm in length from actively growing tips with mostly green wood. Rooting time is variable as long as two to three months. After root growth and new stem growth are obvious, transfer the new plant to a standard potting mix.